Association of Mackenzie Mountains Outfitters – Mackenzie Mountain Hunting Trips - Arctic Red River Outfitters Ltd.
Arctic Red River Outfitters Ltd. is an exclusively fly-in backpack operation located in the northern end of the MacKenzie mountain range. Our nearly 10,000 square mile hunting concession is accessible only by bush aircraft. The remoteness of our huge area contributes to very high success rates on quality big game animals. 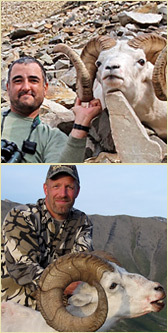 Primarily known for exceptional Dall sheep, our area has also produced many record-book Mountain caribou and some very respectable Alaska/Yukon moose. 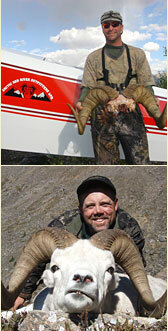 Our hunting area is accessed through Norman Wells, which is services by daily jet service from Alberta. 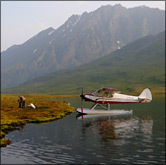 From Norman Wells, you are chartered into our base-camp and then moved to a hunting location by one of our own aircraft. Our guides are skilled professionals and are there to provide you, the hunter, with a safe enjoyable and successful experience in the northern MacKenzie Mountains.